During March 2013, there was a port call to Visakhapatnam in India’s eastern coast by the Myanmar Navy flotilla, comprising of a frigate and a corvette. While India is opening up and encouraging such interactions, what is significant about this port call from the Myanmar Navy? Are defence ties between the two countries warming up? Is there a roadmap to take this forward? Dr Vijay Sakhuja, Director (Research), Indian Council of World Affairs, New Delhi, raised these questions while analysing the prospects of expanding naval ties between India and Myanmar. “The above port call was significant from two perspectives. First, it showcased the growing trust between the defence establishments of India and Myanmar. The ships visit followed the highly successful visit by the Indian Defence Minister A.K. Antony to Myanmar in January 2013 in order to ‘bolster defence ties, ranging from better border management to capacitybuilding of the Myanmar’s armed forces’. In the past, the Myanmar Navy has participated in the biennial Milan exercises hosted by the Indian Navy at Port Blair in the Andaman and Nicobar Islands. “Second, after the port call, the two navies also conducted joint exercises and engaged in coordinated patrol along the maritime boundary between Myanmar’s Coco Islands and India’s Landfall Island, the northernmost island of the Andaman group. This was recognised as a positive development between the two maritime neighbours to address common concerns, particularly illegal fishing, poaching, smuggling, and oil spill response given that these waters witness high shipping activity,” observed Vijay Sakhuja. He added that the coordinated patrol should also be seen through the prism of Myanmar-China relations. It will be useful to recall that there had been speculations amongst the Indian strategic community that the Coco Islands were being used by the Chinese to monitor Indian naval activity in the Andaman and Nicobar Islands. The coordinated patrolling would at least put to rest suspicions about the presence of Chinese electronic surveillance equipment on the Coco Islands. The Myanmar Navy suffered major devastation caused by Cyclone Nargis in 2008. Reportedly, some 25 vessels sunk and 30 officers and 250 naval personnel lost their lives. As per available information, the Myanmar Naval flotilla comprises frigates, corvettes and fast attack craft fitted with missiles and guns, and a number of patrol vessels. The frigates are of Chinese origin and the missile boats are fitted with the Chinese C 802 (range 120 kilometres) surface-to-surface missiles (SSMs). Myanmar has also developed capability, ostensibly with Chinese assistance, to build warships. Aung-zeya class frigates and stealth corvettes are good examples. The frigates are fitted with Kh-35E antiship missiles and the corvettes have C 802 SSMs. Reports also suggest that 20 vessels of the ‘5-series fast attack craft’ are under construction at the Navy’s dockyard, as also in the privately owned Sinmalaik Dockyard in Yangon. The-bulk of the Myanmar Navy is built around smaller craft for coastal patrolling, and its ability to respond to humanitarian assistance and disaster relief is limited. Earlier this year, the navies of both countries for the first time launched coordinated patrols along their maritime borders in the Bay of Bengal against poachers, smugglers and other sea criminals. Both navies regularly hold joint exercises in the maritime domain, including the one held off Visakhapatnam coast in March, when a frigate and a corvette from Myanmar visited the Indian port. Naypyidaw (capital of Mynamar) also sent at least one of its warships to Port Blair for the biennial Milan joint exercise of navies. 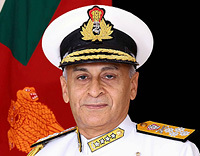 During the recently concluded visit to India by the Myanmar Navy Chief, a leading newspaper observed that as part of the overall policy to counter China’s strategic moves in the region, India now plans to assist Myanmar in building offshore patrol vessels (OPVs) as well as further ramp up military training for Myanmar armed forces. During the visit of Myanmar Navy Chief, Vice Admiral Thura Thet Swe, the measures to bolster bilateral military ties were discussed with Admiral D.K. Joshi, Chief of the Naval Staff, General Bikram Singh, Chief of Army Staff, and R.K. Mathur, Defence Secretary. 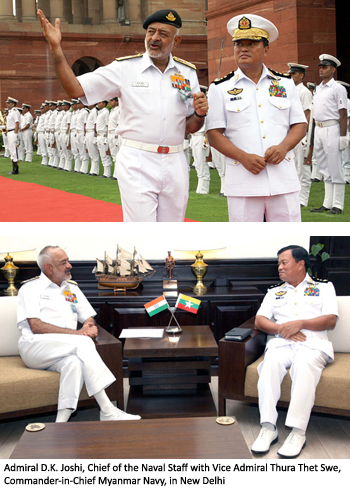 In a media interaction during a Guard of Honour organised for the visiting dignitary in the South Block forecourt, Admiral Joshi described Myanmar as “one of the closest neighbours.” “We share a land border as well as a maritime border with them. On the navy-to-navy front, we have had extremely cordial relation.” He also noted that the Indian Navy was looking forward to taking the existing “excellent” interaction to the next level. Vice Admiral Swe stressed the special ties between the navies of the two countries. Sources said that India has agreed “in principle” to Myanmar’s request for assistance in building offshore patrol vessels OPVs, which are likely to be constructed at an Indian shipyard, as well as almost doubling the number of vacancies for training Myanmar Navy officers and sailors. 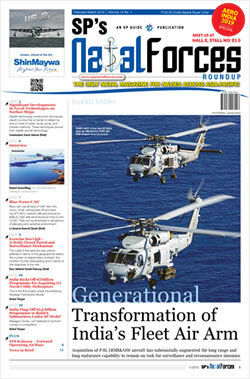 Similar will be the case for soldiers and air force personnel, with plans also afoot to train Myanmar pilots to fly the Russian-origin Mi-35 attack helicopters, as part of the overall “capacity building and enhancement” plan. India has supplied some military hardware and software to Myanmar, which ranges from four Islander maritime patrol aircraft and naval gun boats to 105mm light artillery guns, mortars, grenade-launchers and rifles. But Myanmar has asked for much more, including radars, sensors and sonars for its naval frigates and corvettes. Myanmar’s importance for India can be gauged from the fact that Defence Minister A.K. Antony, Minister of External Affairs Salman Khurshid and Chief of the Air Staff Air Chief Marshal N.A.K. Browne, who is the Chairman of the Chiefs of Staff Committee, among others, have all visited Myanmar since November 2012. Prime Minister Manmohan Singh had himself visited Myanmar in May 2012, the first such top-level visit from India in 25 years, to lay the foundation for greater bilateral economic cooperation. The two countries had then inked a dozen MoU from an air services agreement and border area development pact to a joint trade and investment forum and extension of a $500-million line of credit to Naypyidaw. There is however a worry for the Indian defence establishment that “not enough” was being done swiftly to meet the longpending requirements of Myanmar, the only Association of South East Asian Nations (ASEAN) country with which India shares borders.